Rene Turrek is a German artist who in one of his recent videos showed how a Lamborghini changes colour when it is painted with heat-sensitive paint. 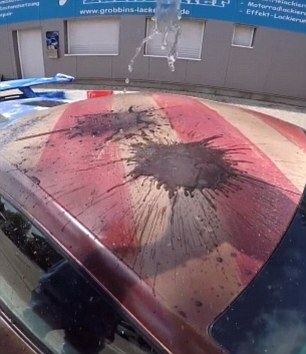 When warm water is splashed on the car it highlights the hidden artwork. This is second such superhero car from this artist. On the surface it just looks like an ordinary purple Lamborghini. However, when heated its surface reveals the amazing Captain America patterns job underneath. In the video below, the German artist shows how the car changes its color when the hot water is poured upon it. 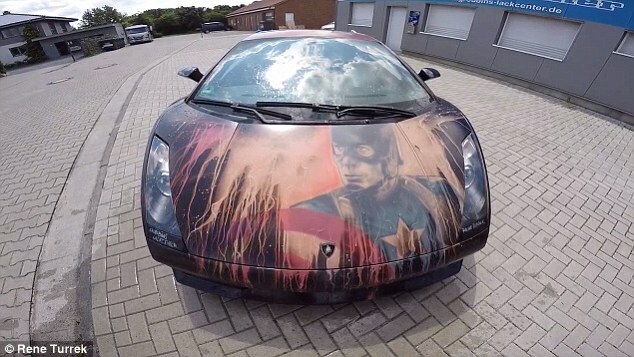 Artist uses heat-sensitive paint to achieve this feat and transform its car into superhero car. This paint is also known as thermochromic paint which responds to the changing color by changing its temperature. We can compare it to the famous Hypercolour T-shirts coming from the 90s. Here, we can easily make out that purple color changes to the translucent to reveal the Superhero design. We can easily see that the artwork is not only detailed but it is also quite professional. 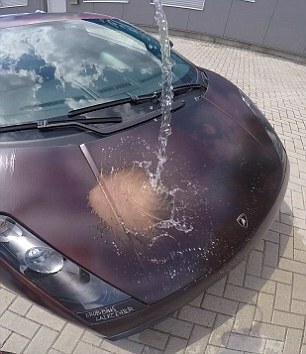 When cold water is poured upon the car it transforms itself back to the original color. This superhero paint is quite expensive and one such paint job has the hefty price tag of $400. If you want all of the car with the same thermochromatic paint, this may cost you thousands of dollars. Rene Turrek started as a Graffiti artist but as the time progressed, he has evolved to do more expensive as well as sophisticated jobs. According, to his auto-blog his recent clients include big brands like Mattel and Nikon.